Apple continues making gains in U.S. market share at the expense of Android and BlackBerry, according to a comScore report that looked at the three months ending August 31st. 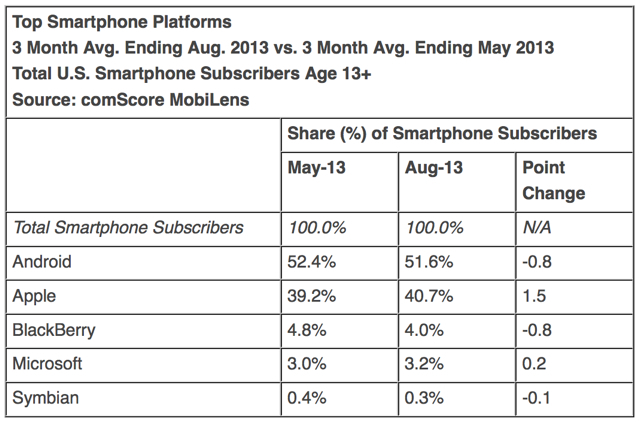 145 million people in the U.S. owned smartphones (60.8 percent mobile market penetration) during the three months ending in August, up 3 percent since May. 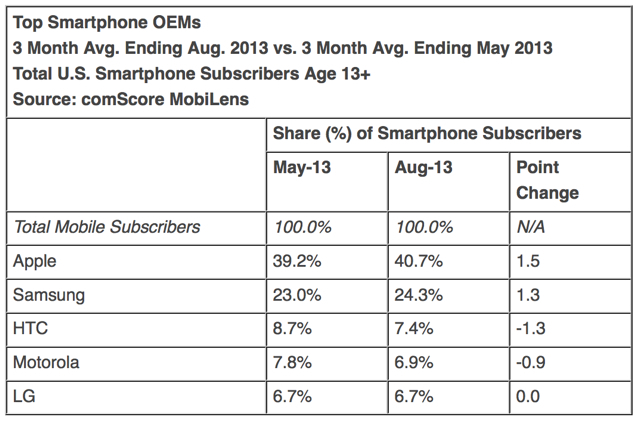 Apple ranked as the top OEM with 40.7 percent of U.S. smartphone subscribers (up 1.5 percentage points from May). Samsung ranked second with 24.3 percent market share (up 1.3 percentage points), followed by HTC with 7.4 percent, Motorola with 6.9 percent and LG with 6.7 percent. Android ranked as the top smartphone platform in August with 51.6 percent market share, followed by Apple with 40.7 percent (up 1.5 percentage points), BlackBerry with 4 percent, Microsoft with 3.2 percent (up 0.2 percentage points) and Symbian with 0.3 percent. 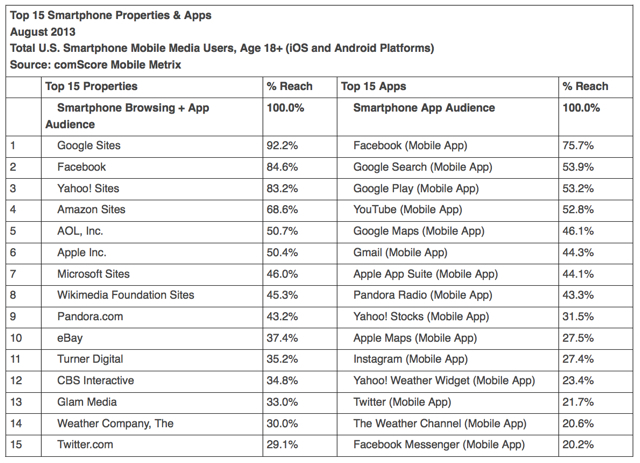 Google Sites ranked as the top web property on smartphones, reaching 92.2 percent of the mobile media audience (mobile browsing and app usage), followed by Facebook (84.6 percent), Yahoo! Sites (83.2 percent) and Amazon Sites (68.6 percent). Facebook ranked as the top smartphone app, reaching 75.7 percent of the app audience, followed by five Google-owned apps: Google Search (53.9 percent), Google Play (53.2 percent), YouTube (52.8 percent), Google Maps (46.1 percent) and Gmail (44.3 percent).